Group 3: The sea, sharks and other creatures from the sea. Group 4: Pirates that can be in the ship and on the island. Each group discusses how they want to make their part of the pirate world and then they draw, paint and cut out what they want. In the end we put all of their artwork together on the wall and it makes our pirate world. 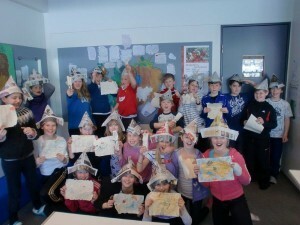 Then we look at our pirate world, discuss it and then each student makes a pirate story using the artwork to help them. Sometimes I frame the stories with colored paper and hang it on the wall next to the pirate picture. The students with their pirate maps and hats.